It is December and time for the traditional flavors of the season: gingerbread, eggnog and chocolate mint! I have a lots of chocolate mint recipes posted and a few egg nog ones, but only one gingerbread recipe (for Gingerbread Biscotti). 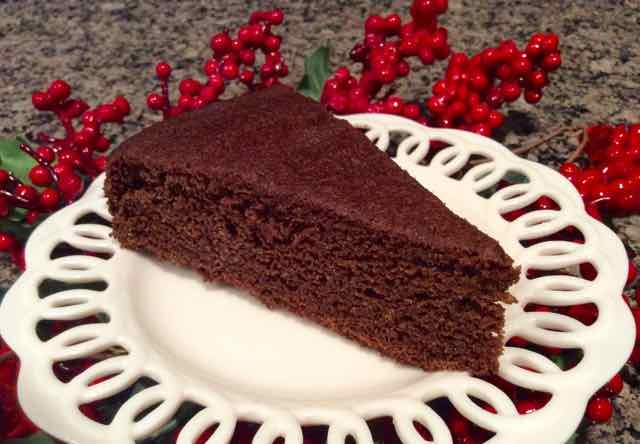 I plan to post a few new gingerbread recipes this year beginning with this one for snack cake. There are many recipes for gingerbread cakes, some lightly flavored some stronger with lots of ginger and molasses. This cake is on the stronger side. 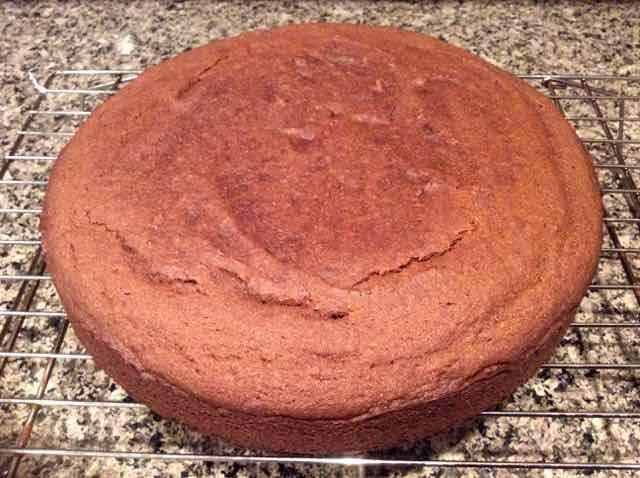 The cake is moist and tastes even better after one or two days. I like it plain, but a cream cheese frosting or a dollop of whipped cream goes well with it. This is called a snack cake because you can eat it anytime of day (breakfast, lunch, dinner, tea time or a coffee break) not just for dessert. 1) Place the oven rack in the bottom third of the oven. Preheat oven to 375℉. Prepare a 9” springform pan by lining the bottom with a circle of parchment paper and greasing the sides and parchment paper. (Note that a regular 9” cake pan will not be deep enough for this recipe, that is why I am using the springform pan.) Set aside. 2) In a bowl add the flours, xanthan gum, salt, baking soda and spices and mix well. Set aside. 3) In a bowl or large glass measuring cup add the hot water and molasses and mix well. Set aside. 4) In the bowl of a stand mixer cream the butter and sugar and sugar for 2 minutes until light and fluffy. 5) Add the egg and vanilla and mix in until well combined. Butter, sugar, eggs and vanilla. 6) Add ⅓ of the flour mixture and mix in well. 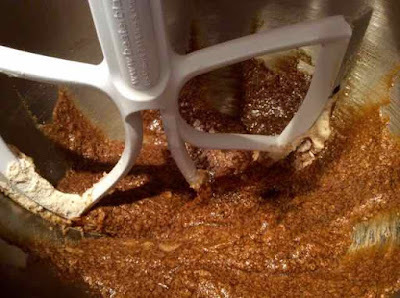 Add ½ of the molasses mixture and mix in well. 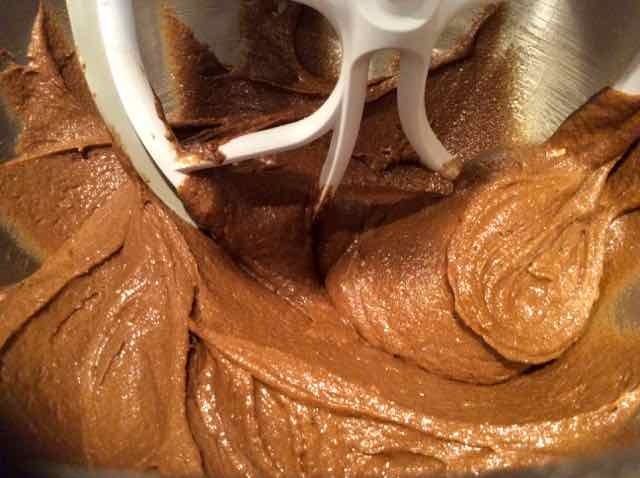 Repeat until all the molasses and flour have been added and well mixed in. Scrape down the sides and bottoms of the bowl and mixer blades and mix on medium speed for one to two minutes. If the batter is not beaten enough the center of the cake will fall. Adding half of the molasses mixture after ⅓ of the flour mixture was mixed with the butter and eggs. 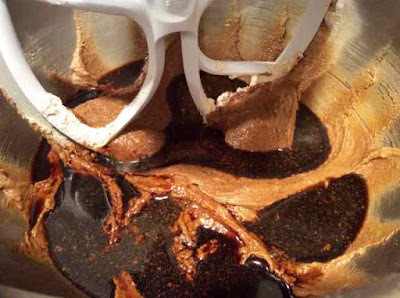 After ½ of the molasses mixture was mixed in. Adding the second ⅓ of the flour mixture. 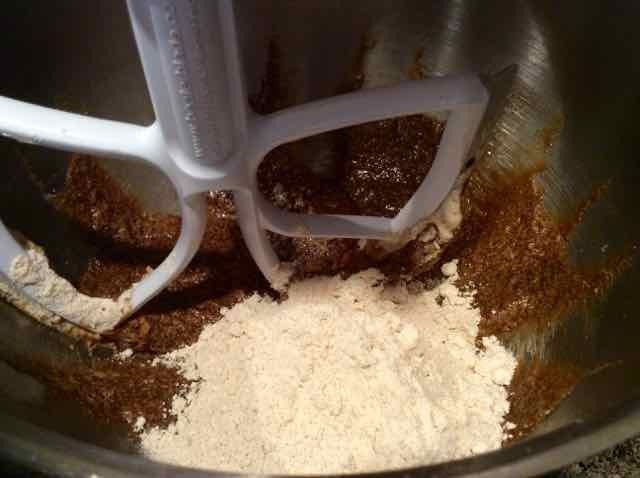 Adding the second ½ of the molasses mixture after the second ⅓ of the flour was mixed in. Adding the last ⅓ of the flour mixture. 8) Allow the cake to cool for 10-15 minutes in the pan on a rack. Then remove the cake from the pan and transfer it to a rack to cool completely. 9) This cake can be eaten plain and it also goes really well with cream cheese frosting or whipped cream. GLUTEN FREE GINGERBREAD SNACK CAKE Makes one 9” round cake 1 cup Sorghum Flour ½ cup Tapioca Flour ¼ cup Chickpea Flour ¼ cup Coconut Flour ¾ tsp Xanthan Gum 1 ½ tsp Baking Soda ¼ tsp Salt 1 ½ tsp Ground Ginger 1 ½ tsp Ground Cinnamon ¼ tsp Ground Cloves ¾ cup/180ml Unsulphured Molasses ¾ cup/180ml Hot Water - 100℉ ½ cup Unsalted Butter - room temperature ⅓ cup Brown Sugar (light or dark)- Packed 1 large Egg - room temperature 1 tsp. Vanilla Extract INGREDIENTS DIRECTIONS 1) Place the oven rack in the bottom third of the oven. Preheat oven to 375℉. Prepare a 9” springform pan by lining the bottom with a circle of parchment paper and greasing the sides and parchment paper. (Note that a regular 9” cake pan will not be deep enough for this rec-ipe, that is why I am using the springform pan.) Set aside. 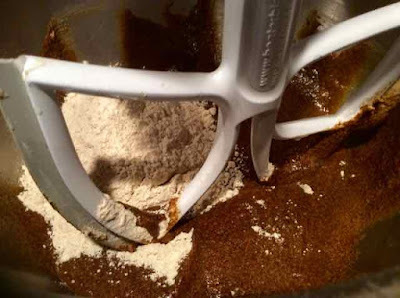 2) In a bowl add the flours, xanthan gum, salt, baking soda and spices and mix well. Set aside. 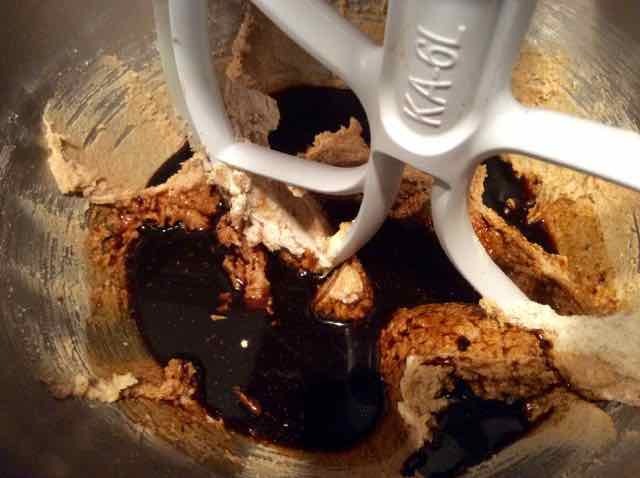 3) In a bowl or large glass measuring cup add the hot water and molasses and mix well. Set aside. 4) In the bowl of a stand mixer cream the butter and sugar and sugar for 2 minutes until light and fluffy. 5) Add the egg and vanilla and mix in until well combined. 6) Add ⅓ of the flour mixture and mix in well. Add ½ of the molasses mixture and mix in well. Repeat until all the molasses and flour have been added and well mixed in. 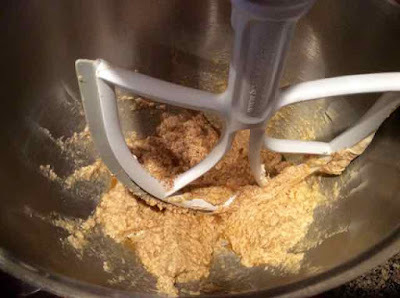 Scrape down the sides and bottoms of the bowl and mixer blades and mix on medium speed for one to two minutes. If the batter is not beaten enough the center of the cake will fall. 7) Pour the batter into the prepared pan and bake at 375℉ for 10 minutes then reduce the oven temperature to 350℉ and bake for another 25 minutes. The cake is done when it springs back when the center is gently pressed with a finger. Baking time will vary accord-ing to your oven; so if your oven tends to run hotter begin to check for doneness 10 minutes sooner. (Note that I have found that with whole gluten free cakes it rises and bakes better at a higher beginning temperature. This boost is not necessary with cupcakes, but it makes a difference with larger cakes.) 8) Allow the cake to cool for 10-15 minutes in the pan on a rack. Then remove the cake from the pan and transfer it to a rack to cool completely. 9) This cake can be eaten plain and it also goes really well with cream cheese frosting.